Thomson Reuters Core Publishing Service focuses on short and long runs of monochrome legal and other publications on lightweight papers. Adding a HP PageWide Web Press T360 with an inline Magnum Flexbook has significantly improved efficiencies for mid-sized to short runs. Learn more in this article sponsored by HP. Thomson Reuters Core Publishing Service began its life in 1872 as part of West Publishing and quickly revolutionized legal publishing. West Publishing was acquired by The Thomson Corporation in 1996, and Thomson acquired Reuters in 2008, creating Thomson Reuters. There are more than 400 employees in the company’s single 1.3 million square foot production facility located in Eagan MN. The shop has 400 different pieces of equipment it uses to deliver 4.6 million subscriptions, along with 1.2 million new orders, annually. “Our core competency is single color short- and long-run production on lightweight paper,” says Larry Soler, Director of the company’s prepress, press and digital departments. “We’ve found an interesting niche in this space beyond our legacy legal work. In order to drive further efficiencies, CPS worked with HP and Magnum to put a Magnum Flexbook in line with the press. “This is a roll-to-glued-book-block workflow that presents book blocks to our bindery for finishing of case binding and soft cover books,” Hughes says. This configuration has proven itself. According to Soler, CPS’ record run was 6.5 million pages in a 24-hour period. “There is no way we could have done this without our HP T360,” he says. “Web offset would have required collating, and even our five toner-based presses didn’t have that much capacity.” The company’s inkjet press began operations in January of 2016. In the first half of the year, it produced more than 500 million pages, a stunning achievement. 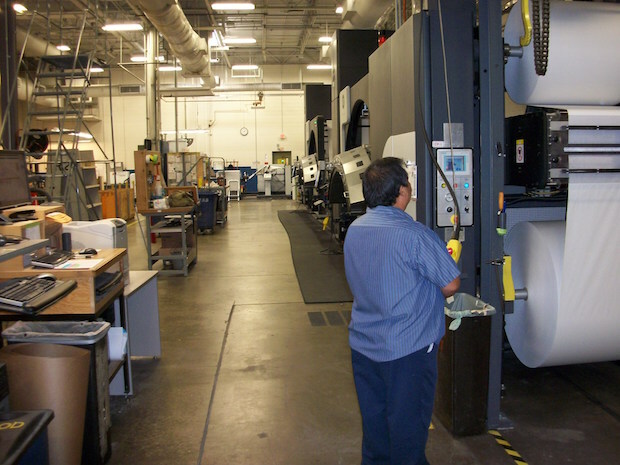 As a result of this added capacity, CPS was able to eliminate three of its five roll-fed toner presses and move some additional work from its web offset operation to get to those volumes quickly. CPS indicates that there is no plan to move to 4-color printing. “While we are seeing run length declines in our legal publishing business,” Soler states, “we have found that we are very competitive in this monochrome space to backfill work. We partner well with publishers and other printers to provide solutions that work for our customers. Successful project lead, Mark Keene, credits the quick ramp up in CPS to the wonderful work by the T360 crews, front end operators, schedulers, engineering, sourcing and bindery staff that quickly collaborated and adapted to the inkjet operations and workflow changes. It takes a full team to make this type of project such a success!